Don't ask me how, friends, but for some reason this little tiered dress is reading as "minimalist" to me. 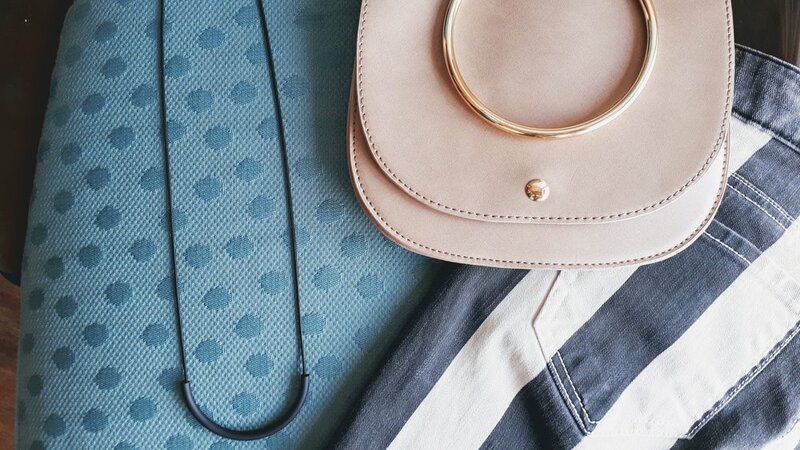 I feel like maybe it's the type of thing we would see on a minimalist fashionista's moodboard of what they are packing in their carry-on for a 4 day trip to Italy. 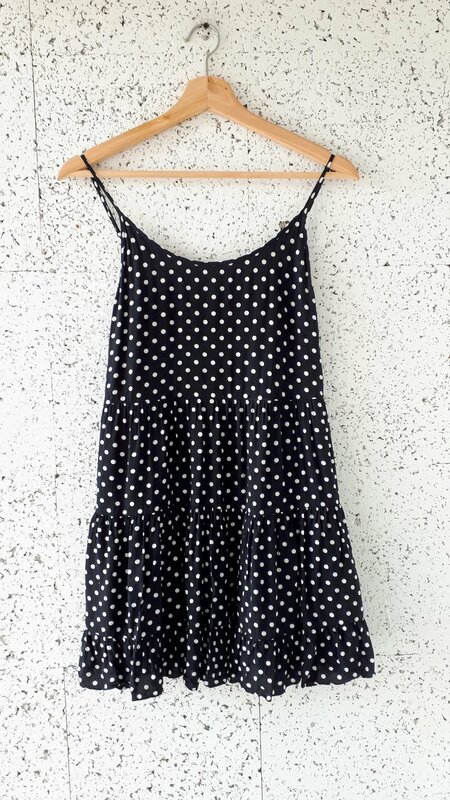 Amongst the grey, beige and chambray would be this little polka dot dress! Just a little added bonus bringing some interest to the back! You know what, friends? I originally thought that this band-top was a contemporary creation, but the more I looked at it, the more I thought this is actually a brilliant refashioning of an old grey t-shirt! I came across this PJ-inspired top from our departed fave Noul, and to be honest, friends, at first I was all "what is this?". But let me tell you what it is: it's a top that *also* belongs in the wardrobe of some fabulous minimalist fashionista! (Brittany Bathgate would totally wear this, amiright? It may look simple, but there are so many things that I love about this necklace! First of all, it's all black, which is not something you see very often in necklaces or pendants. At first I thought it was made of rubber (I don't know), but the u-shape pendant part is enamel, and the chain is a black metal snake chain! Plus, it's totally from outer space! Remember these awesome pants from the back room a few weeks ago? These are the Liam Pant from Generic Denim, and friends, although I don't typically wear pants (how do you get them on? One leg at a time or something? ), I SCOURED the internet to track these down in my size. (Well, kinda scoured, because, you know, I'm lazy). It is not very often that a piece blows me over so much that I actually bother to try to track down something similar, but that's how much I love these pants! Unfortunately, everyone on the internet also loves them, and there are no more to be found...except if you are a size 26, you can get them right here! A Red Pony friend looking in the men's section told me that he recently just found out he has been wearing the wrong size shoes...like how 80% of women are wearing the wrong size bra! This seemed hilarious to me thinking that 80% of men are wearing the wrong shoe size! But, look, we have you covered because the Topman Hale brogues that we have in the shop come in 2 different sizes! This delightful pale yellow sweater is just hanging out acting all casual...and being Rag & Bone! Love this type of ombre/bleach-dipped denim shirt! I promise I will stop using the term "minimalist" or referring to any space or time travel for the rest of the blog.....right after this purse! It has identical pockets on both sides! Special treat this week: a Pink Tartan skirt! I love the felted wool and the blurry effect of the patern. It's playful and serious at the same time. ...and it fit her PERFECTLY! She knew that she had found a real gem, so we can all sleep well at night knowing this one went to a home that will definately appreciate it! In case you missed the news, Red Pony is relocating to Whyte Ave and 99 Street at the end of September. We finally got into the new space for real yesterday! ...and she actually stripped the WHOLE STORE! So that's one thing done already! Check! This space will get cuter, I promise! I am going out of town for a few days (since we are sooooooo far ahead of our reno schedule now that the wallpaper is down! Ha!) so no blog next week (sorry!). Red Pony is open regular hours (but don't forget that we are closed Sundays in August), and I will be in the shop on Saturday, August 11 if you want to come give me a reality-check on how long renovations actually take!